Once again, Eberlestock churns out another fantastic backpack, the M5 Elk Pack. And just as its name suggests, this pack was made specifically for the Elk hunters. However, don’t let that fool you, the eberlestock M5 team elk pack is great for any other hunter as well, it doesn’t discriminate. It has the characteristic Eberlestock family qualities. That’s the strong build, the versatile nature, and top notch functionality. It proudly carries the Eberlestock badge, indicating that it’s a backpack you can trust. On top of that, the M5 is also blazoned with the Team Elk Logo, underscoring its commitment to the Elk hunters. 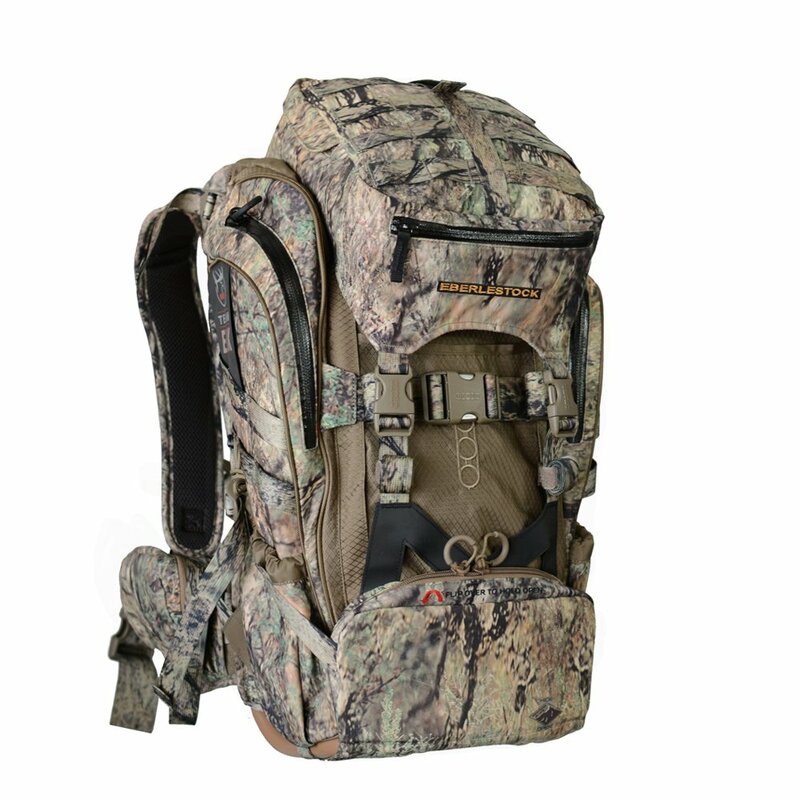 And we all know that a backpack that can handle Elk hunting will also easily handle all kinds of hunting. So, if you’re looking for the ideal daypack then read on. If you’re looking for a backpack that remains strong in the face of harsh conditions, then keep reading. Here’s the Eberlestock M5 Team Elk Pack Review. Being an Elk pack, we know for certain that it’s got ample space. And for sure, Eberlestock made sure it provided more than enough space to carry your gear. With an array of pockets and compartments, everything from your fragile gear to the tripods will find room in the pack. Bearing dimensions of 23 inches by 11 inches by 9.5 inches, it presents a sizeable footprint. This all adds up to a carrying capacity of a whopping 3100 cubic inches. All this is at your disposal. You can access this real estate either through the front or the top. Both access points place your gear within easy reach, enabling you to pull out whatever you need at a moment’s notice. So, yes, the M5 can carry a massive load. You’ll most definitely find yourself filling this pack to its capacity, stuffing every last pocket or compartment with your essentials. But wait, won’t this make the backpack unbearably heavy? Well, to mitigate this, the people at Eberlestock built into the M5 an index frame. The material is strong yet lightweight. This frame will take the weight of the pack and cleverly divert it from your shoulders, keeping them from feeling the strain of the weight. It will then transfer this weight onto your hips and waist. This gives you a mare upright posture and allows you to carry the backpack without feeling fatigue. End of the day, you’ll not only carry the pack for a long distance, but you’ll also feel comfortable while doing it. For any hunting pack, a means to carry your weapon is a mandatory feature. Nobody wants to be lugging a rifle in their hand while hiking up a hill. Eberlestock M5 Team Elk Pack allows you to keep your hands free because, well, you’ll need them for tactical things. With its elaborate weapon carrying system, you won’t have to worry about carrying the weapon in your hands. First, it has a fold away scabbard. This fits a full-scale rifle. When in there, the rifle is securely held while placed at a convenient position to allow you easy reach without having to remove the backpack. But there’s more. The M5 can at the same time carry a bow. There’s a built-in bow carrier in which a compound bow or a bow of any other kind can easily fit. We’re always talking about how water is a vital component of a successful hunting expedition. There’s always a hike involved before one reaches their ideal hunting spot. And as you carry the pack along, you’re bound to get a little or a lot thirsty, right? Having a pack that understands this is essential. The M5 understands. In it, there’s a hydration pocket. You’ll then, in the pocket, fit in a compatible hydration reservoir that you can fill up with water. Attach a bladder and what you get is a constant supply of water as you walk. There’s no need to take off the pack neither is there a need to hold on to a bulky bottle. The pack holds the water and lets you do the drinking. You’re in the bush. You’re up a tree. Perhaps you’re hiking up a hill. Wherever you go, your motive is to get the right site in which you can hunt the perfect prey. What scenarios have in common? Harsh conditions. That’s for the backpack at least. Some branches scratch the backpack. Some rocks will attempt to deface the pack. Whatever the case, a hunting pack has to be able to withstand all the punishment it’ll get from the environment. It must stand tall and stoic in the face of a beating. The Eberlestock M5 Team Elk Pack is built with this purpose in mind. The material it’s made of is highly impervious to scratches, allowing it to remain to look good for a long time. Still, this material endows the pack with a silent nature. It doesn’t utter a sound even as you jostle to get something out of its pockets or as you move along. And we know that silence is key to a successful hunt. The Eberlestock M5 Team Elk Pack has an ample carrying capacity of 3100 cubic inches, more than enough to a day’s hunting trip. With the inbuilt tubular aluminum frame, the pack makes it less strenuous to carry a heavy load while transferring most of the weight to your waist and hips. To carry your weapons, you get a fold away rifle scabbard and a built in bow carrier. The M5 allows easy access to the compartments by providing front loading and top loading access. With the built in hydration pockets, you can attach a compatible reservoir and remain constantly supplied with water. The side pouches of the pack are meant to accommodate spotting scopes. These pouches are small in size for the larger sized spotting scopes. Q: Weight of the pack when empty? A: It weighs just 6 pounds and 8 ounces. Q: How many liters reservoir can fit in the hydration pocket? A: It can fit with about 3 liters of a hydration reservoir although two liters also fits perfectly. Q: What color options are there? A: The Eberlestock M5 Team Elk Pack comes in Hide-Open Western Slope color and Hide-Open Timber veil color. A: It’s an Intex Aluminum frame. Q: What is the length of the side compartments? A: They measure about 18 inches long. An Elk pack is one which a lot is expected. The Eberlestock M5 Team Elk Pack doesn’t disappoint. If you’re looking for a perfect sized daypack, this is the one for you. If you’re after a pack that will stand the test of time, then go for the M5. It bears all the good quality of the Eberlestock brand and being blazoned with the Team Elk tag; it shows us how tough a member of the team needs to be. So, as we reach the end of this Eberlestock M5 Team Elk Pack Review, we encourage you to out and get yourself one of these.